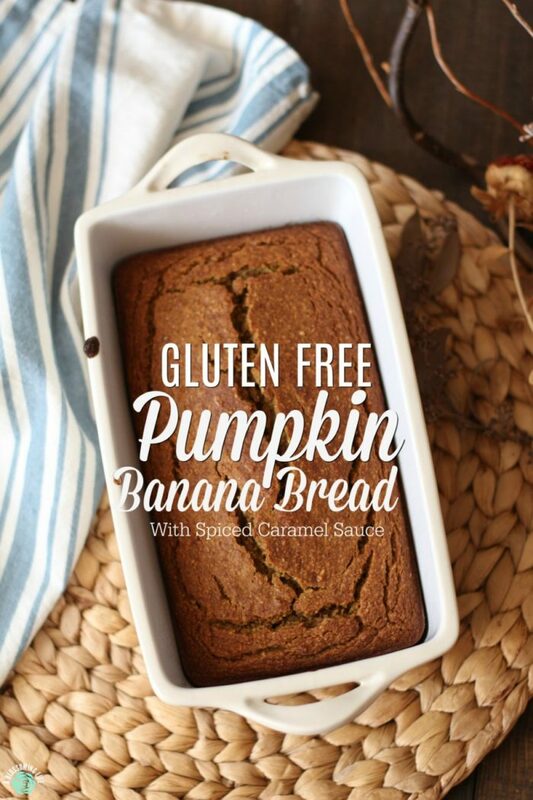 I really threw the idea around whether or not to call this pumpkin banana bread, because there isn’t a whole lot of banana or banana flavor. But, there is this delicate hint of banana in the background that my husband didn’t notice. 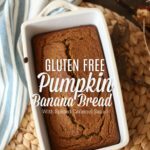 This delicious pumpkin banana bread has a lovely oat texture greeted with a light sweetness from maple syrup and banana and the beautiful, warm flavor of pumpkin spice. Top it off with some wonderful pumpkin spice caramel sauce made without refined sugar and, boy, you are in for a treat. Your family will surely love it as much as mine. My two-year-old ate 2.5 large slices of it in one sitting and wouldn’t stop asking for a “muffin” the entire time. Want to know how to teach patience? 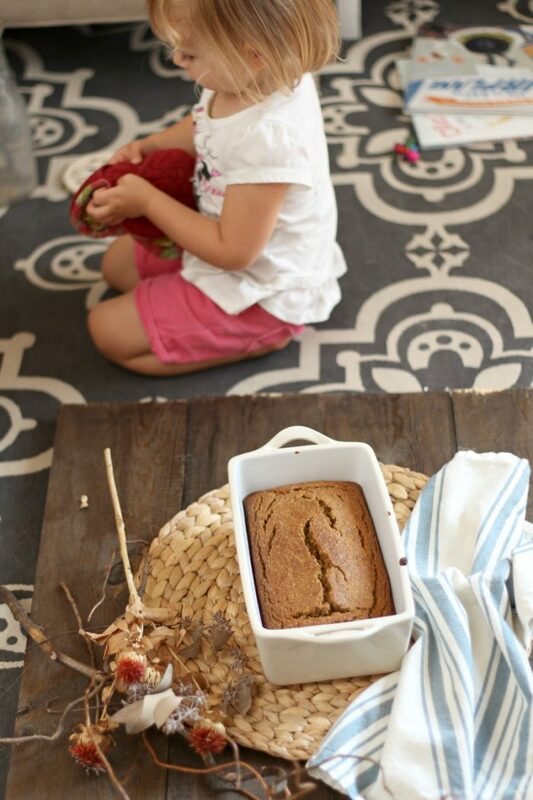 You tell your toddler you’re making pumpkin bread, make it, bake it, let it cool, and then take pictures of it before letting said toddler eat it. If I had five dollars every time she asked for a “muffin” during this time, I would surely be rich. Now that it is September, I feel that it is safe to bust out all things pumpkin and fall without all the judgement that it is “too early.” Is there really such a thing? Not in my book. Honestly, I made this at the end of August and, while strolling the farmer’s market with a friend, I mentioned making this bread and the first thing she said was “you’re already making pumpkin things?” You betcha. Haters gonna hate, yo. She just apparently doesn’t have the same love and appreciation for pumpkin spice things that I have. Maybe it’s an obsession… whatevs. I’m cool with it. This is our first fall in Oregon, and I must say that the weather is a huge teaser. For the last few weeks, every morning we are greeted with crisp, cool, fall-like air and a few leaves changing color, only to be met with hot, 85-100 degree afternoons. My fall loving self doesn’t know what to do with this weather, but I must embrace it before the rainy season starts. Then the sun will rarely show its warm face, and we will be stuck inside most of the time. So, until then, I will be making all things pumpkin and pumpkin spice. To make the spiced caramel sauce, add 1 tsp to original caramel sauce recipe at the end. Top everything with it. 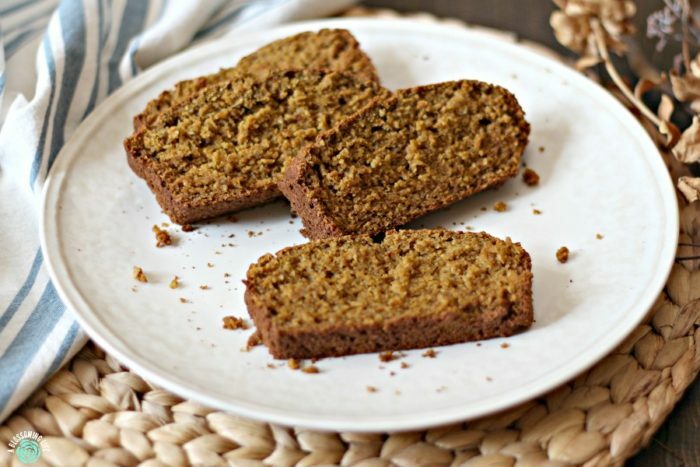 This delicious pumpkin banana bread has a lovely oat texture greeted with a light sweetness from maple syrup and banana and the beautiful, warm flavor of pumpkin spice. Top it off with some wonderful pumpkin spice caramel sauce made without refined sugar and, boy, you are in for a treat. Preheat oven to 350 and grease a bread pan well. In a blender or food processor, make oat flour by grinding oats into a fine flour, and place into bowl. Add coconut flour, baking soda, salt, and pumpkin spice to ground oats and stir. In the blender, add banana, canned pumpkin, oil, eggs, and maple syrup. Blend for 1-2 minutes until completely combined and smooth. Stir wet ingredients into dry ingredients and pour into bread pan. Bake for 45-60 minutes until you can insert a toothpick and it comes out clean. Top with spiced caramel sauce (optional). Add 1 tbs of pumpkin spice for light spiced flavor, and 1.5 tbs if you like a stronger pumpkin spice flavor. 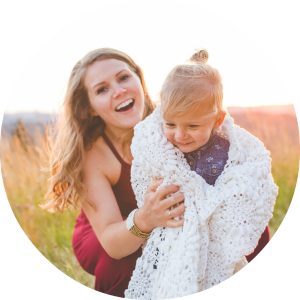 Work from home mom life… Trying to be ohhhh so patient. 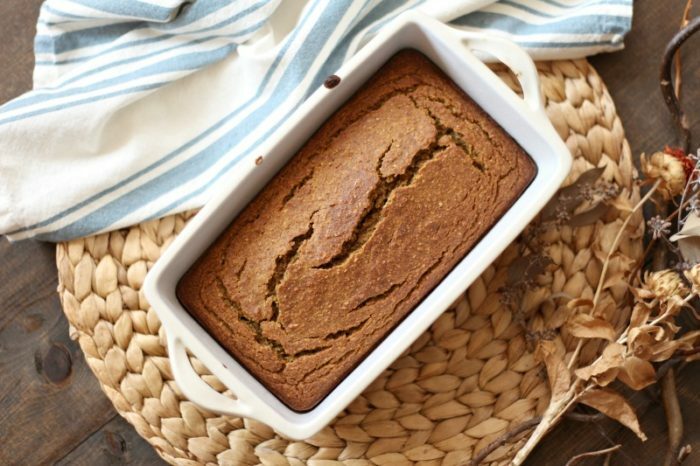 Do you love all things pumpkin also? 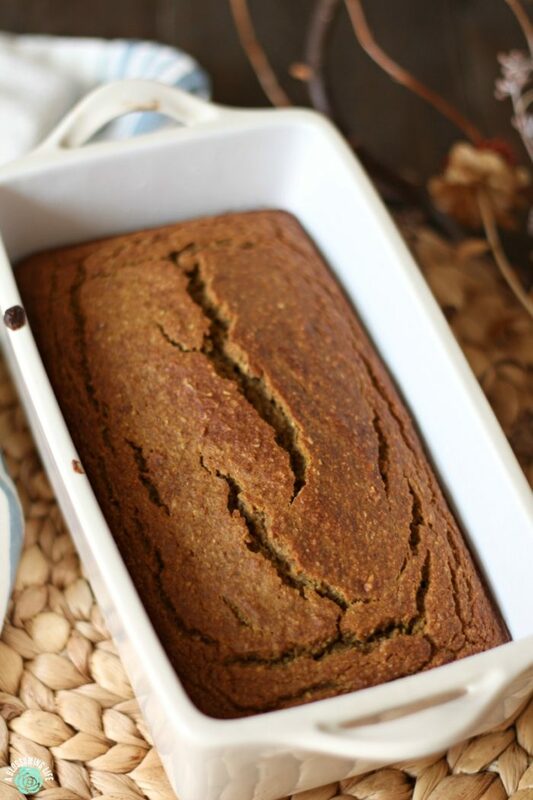 Don’t worry there will be another pumpkin spice recipe on the blog next week.